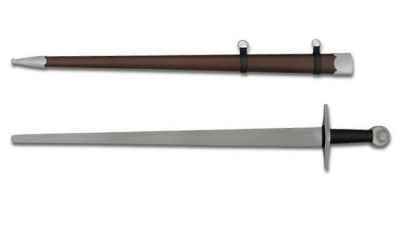 The Tourney Series Medieval Sparring Sword from Kingston Arms will set a new standard in this price point of re-enactment weaponry. 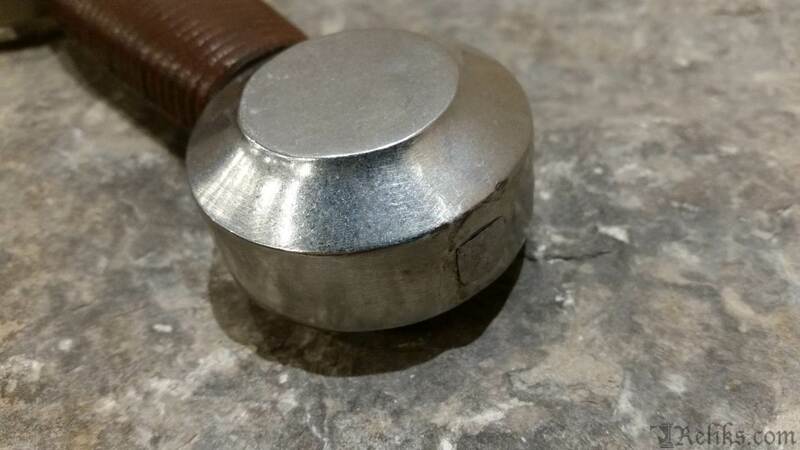 Features like thru-tang handle construction, peened thru-tang stainless steel pommel and guard, and 2mm rounded edge thickness make this a brutal weapon on the battle field. The cord wrapped leather grip feels exceptional in the hand with an oval cross section and slight barrel shape to keep fatigue at bay. 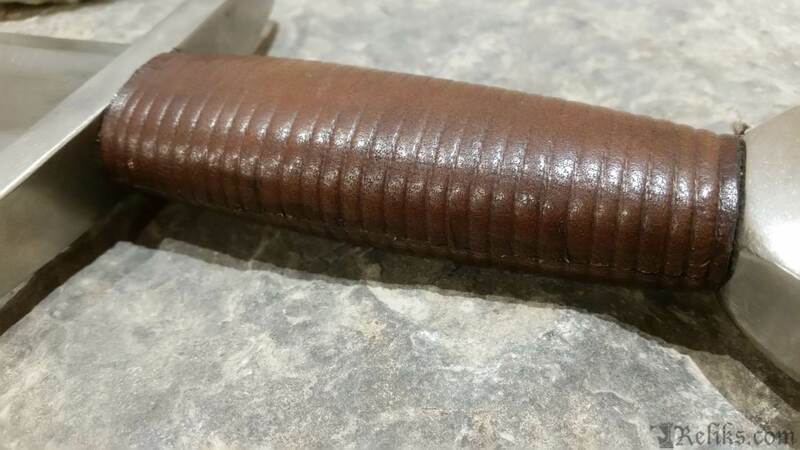 The grip is large enough to accomodate armoured hands. 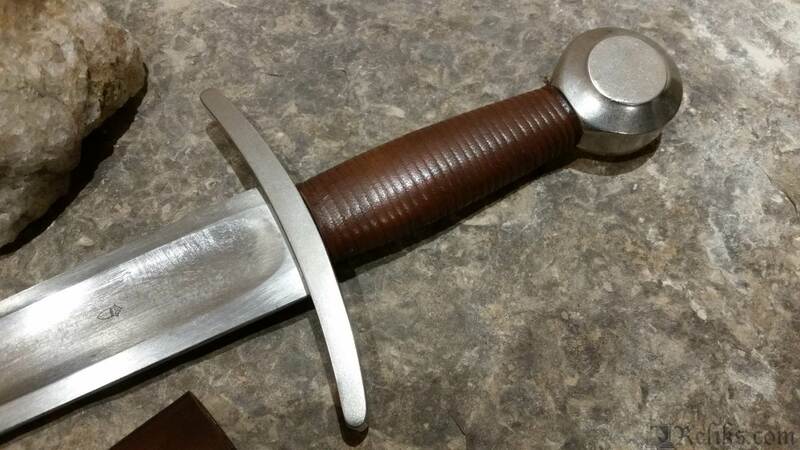 A respectable fuller runs the length of the blade to lighten and counter balance the swords overall. 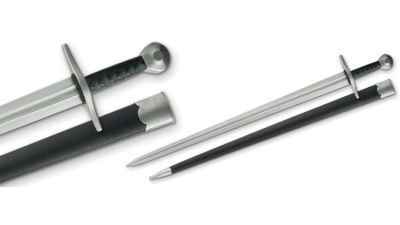 A wood core and leather wrapped scabbard tipped with a stainless chape comes with each sword. 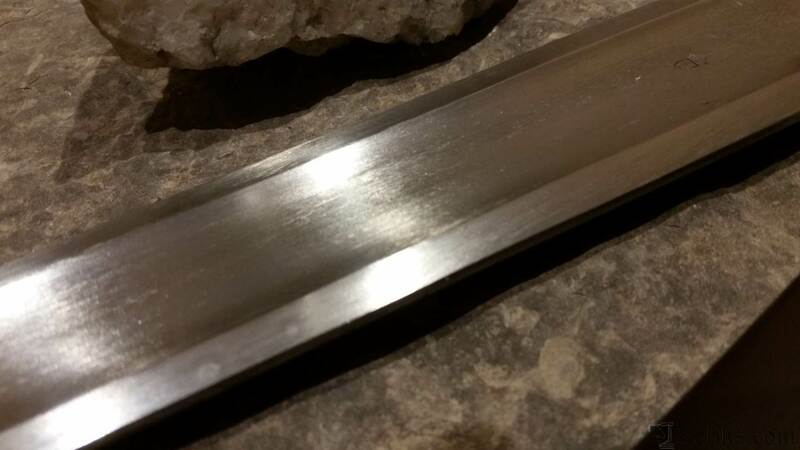 The blade is forged from 9260 high carbon spring steel and is tempered to about 50 Hrc, providing a long lasting sword. The guard needs special mention, featuring the King-Peen system. 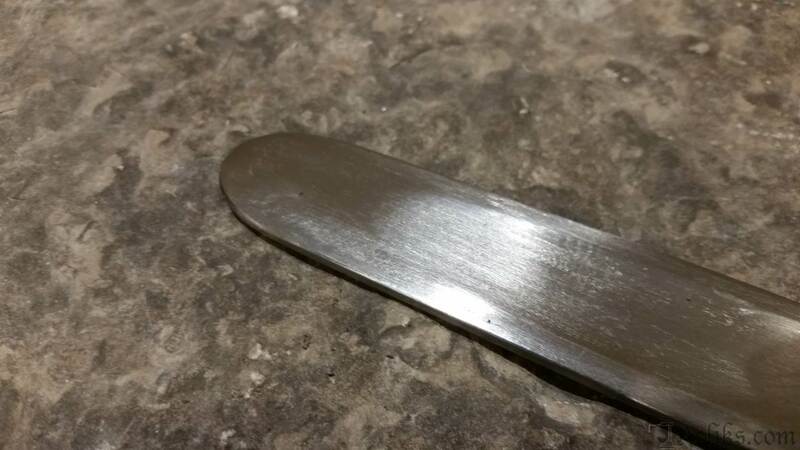 King-Peen is essentially a steel tab on the guard under the grip that is pinned through the tang of the sword. This process keeps the guard from going loose after a lengthy campaign without compromising the strength of the hilt. 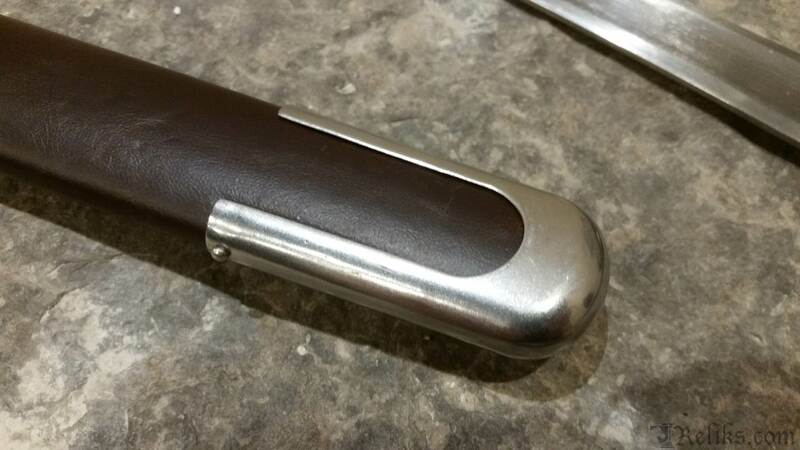 The pommel is pressed into place and hot peened. 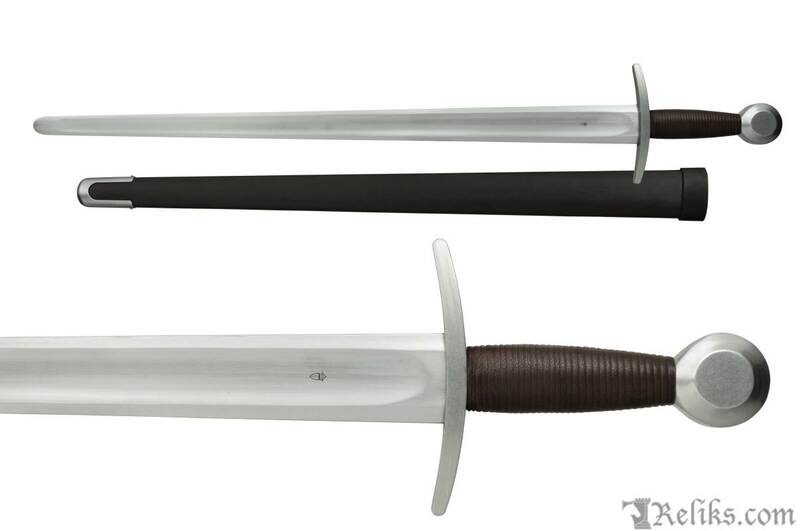 Combine these two processes and you get a sword that rings like a bell when struck. 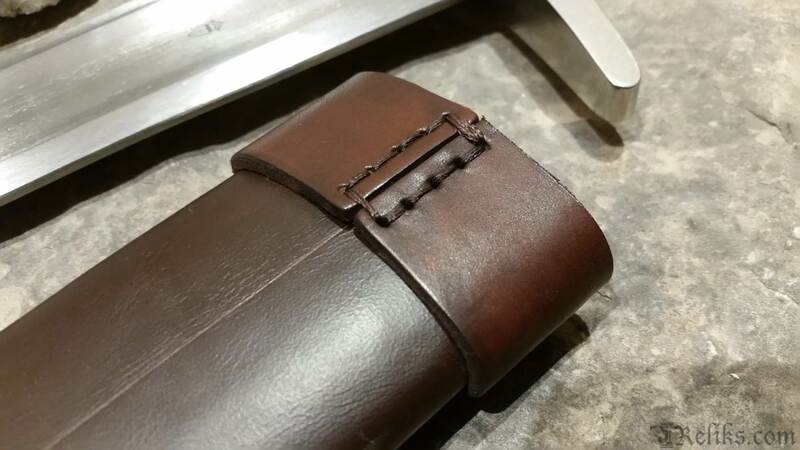 Stitched Throat - The throat of the scabbard is made from stitched leather. Tourney Arming Sword - The Tourney Series Medieval Sparring Sword from Kingston Arms will set a new standard in this price point of re-enactment weaponry. 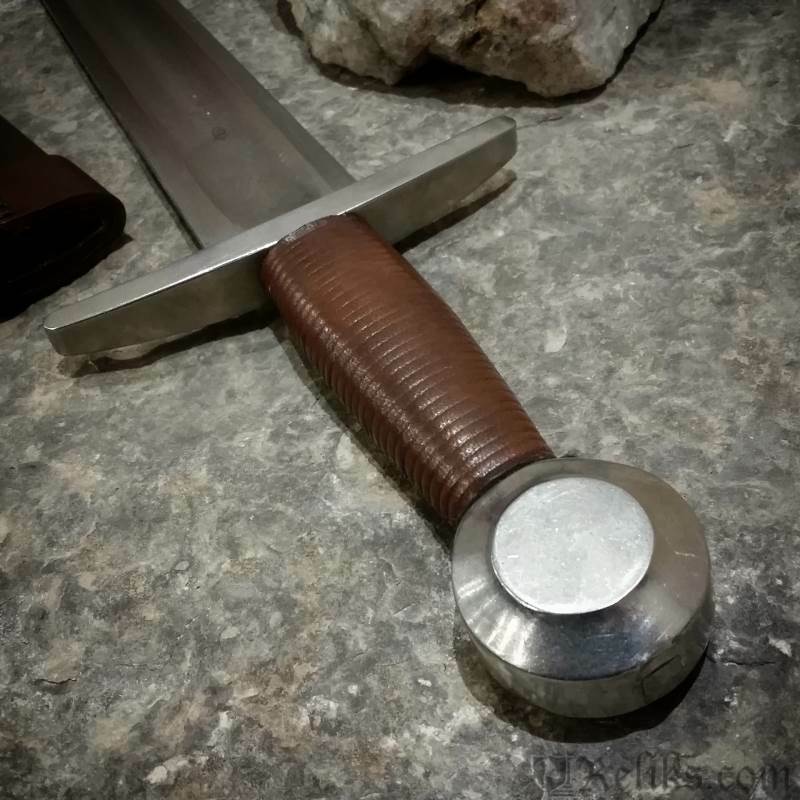 Tourney Arming Sword Handle - The cord wrapped leather grip feels exceptional in the hand with an oval cross section and slight barrel shape to keep fatigue at bay. The grip is large enough to accomodate armoured hands. 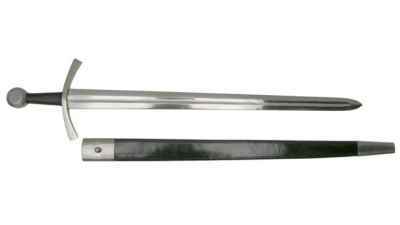 Kingston Arm Tourney Arming Sword - The blade of the Tourney Arming Sword is forged from 9260 high carbon spring steel and is tempered to about 50 Hrc, providing a long lasting sword.